Official Viwawa Blog: Viwawa Wawa Mystic Palace is out. Be Mystified! 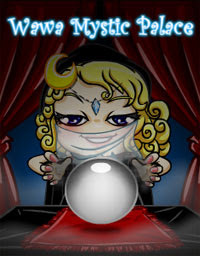 Viwawa Wawa Mystic Palace is out. Be Mystified! We just hired a special Gypsy Wawa, and we heard that she has special powers. Apparently those powers are to give free items and prizes to all who visit her! Go ahead and stopover at Viwawa Wawa Mystic Palace, and see what is bestowed on you from her! server error? pls try again later? New MOLePoints Topup method in Indonesia! Have a blast with Viwawa @ The Games Xpo 2009!